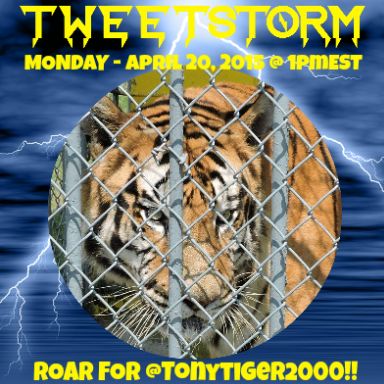 Visit tinyurl.com/helptonytiger for more ways you can advocate for Tony. Updates will be posted when they are made available. We can make a difference by taking action for animals in need. Please participate in these actions and share the links with friends, family and on social networking sites like Twitter and Facebook. 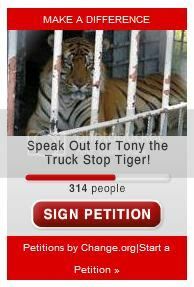 Thanks again for your support of Tony and for all animals who deserve our respect, protection and advocacy for their welfare. 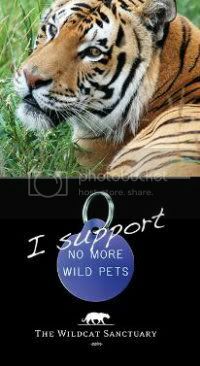 Actions To Take To Help Big Cats!!! Please ask your Congress Member to support H.R.4122 – The Big Cats and Public Safety Protection Act. This bill would prohibit private possession of big cats except at highly-qualified facilities like accredited zoos where they can be properly cared for and safely managed. You can also sign this petition: Tell Congress: Big Cats are NOT Pets! More Petitions and Actions for Animals Who Need Our Help! Lucy is a beautiful 35 year old Asian elephant who lives alone at the Edmonton Valley Zoo. The Elephant Sanctuary in Tennessee has agreed to take Lucy as has PAWS Ark 2000 Sanctuary in California but their offers have been turned down by the city of Edmonton. These sanctuaries would provide the habitat and climate Lucy needs as well as elephant companionship which is so vital to these wonderful animals. “Limba is known to be the oldest elephant in Canada. She was born in Vietnam in 1964. At the age of one year she was torn from her family, beaten, chained, and then dragged to North America. Since that day Limba was ordered to perform to entertain the crowds. Ben the bear is used as a roadside attraction at Jambbas Ranch Tours in Fayetteville NC. Despite AWA violations, including unsanitary conditions, hazardous enclosures, failure to provide adequate veterinary care, and failure to supply sufficient quantities of food and potable water, the U.S. Department of Agriculture has continued to renew Jambbas’ license. On April 19th, 2011, the Animal Legal Defense Fund, PETA, and two residents of Cumberland County, NC filed a lawsuit against the USDA challenging its decision to renew Jambbas’ federal Animal Welfare Act (AWA) license. Ben and the other animals at Jambbas need our help! Please Sign: Mayor Mike Bloomberg: Stop the Abuse of NYC Carriage Horses! 8 Accidents in 8 Months! Visit: http://ny-class.org/ to sign another petition calling for the end to carriage horses in New York City and to also co-sign Angelica Huston’s letter to Christine C. Quinn, Speaker of the New York City Council. Help Circus Animals! Support H.R. 3359 The Traveling Exotic Animal Protection Act! Animals in circuses and traveling shows are subjected to horrific abuse, confinement, exploitation and cruelty. For the few minutes the public is “entertained” by them performing ridiculous unnatural stunts, these animals suffer a lifetime of misery. On November 2, 2011, Congressman Jim Moran (D-VA) along with Jan Creamer (Animal Defenders International,) Ed Stewart (Performing Animal Welfare Society -PAWS) Dr. Mel Richardson, DVM, Bob Barker, and Jorja Fox, introduced H.R. 3359 – The Traveling Exotic Animal Protection Act. This federal bill would amend the Animal Welfare Act to restrict the use of exotic and non-domesticated animals in circuses and traveling shows. It is crucial that we support this bill. Please contact your congress member and tell them as their constituent you support H.R. 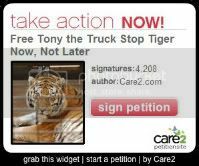 3359 – The Traveling Exotic Animal Protection Act and ask them to co-sponsor this bill. It takes only a few minutes to call, write, e-mail or fax your representative for animals that endure inhumane conditions and abuse. For more information about H.R. 3359 / TEAPA visit Break The Chain “the campaign to bring an end to circus animal suffering in the USA, led by Animal Defenders International.” Break The Chain has updates about the campaign, resources, and more ways to take action. Using animals in circuses and traveling shows is not only cruel and inhumane, but it is a threat public safety – this archaic and practice must end – with support of H.R. 3359 we can make that happen. National measures to prohibit the use of wild animals, or selected species, have been adopted in: Austria, Czech Republic, Denmark, Malta, Slovakia, Sweden, Portugal, Taiwan, Singapore, Bolivia, Costa Rica, India and Israel. Similar laws are being discussed in: United Kingdom, Netherlands, Brazil, Chile, Colombia, Norway, and Peru. Due to public concerns, local town and city bans are in place in the US, UK, Brazil and many other countries.